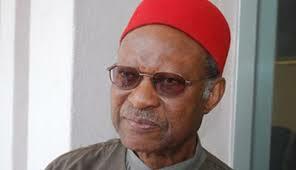 (News Investigators) /A former Secretary-General of the Commonwealth, Emeka Anyaoku, has called on the Nigerian Government to ensure that the February and March elections are free and fair, saying the world’s attention is on Nigeria. Mr Anyaoku said the expectations of the people and indeed the international community were that the elections would be credible. The former Commonwealth scribe spoke, Tuesday, at a symposium to unveil the new logo of The Nigerian Tribune in Lagos. The theme of the symposium was “Electoral Integrity, Legitimacy of Democratic Institutions and Good Governance”. Mr Anyaoku said the rest of the world was keenly watching Nigeria and the conduct would determine how the country would be viewed and treated by the international community. “First, Nigeria’s friends and the whole of the international community are watching. Watching the behaviour of federal government and its agencies, including especially the police, the army and the other law-enforcement agents, to see how far we respect the country’s constitution, the rule of law and the obligation to act well in playing their roles in respect of the elections. “Indeed, the image and standing of our country within the international community will be significantly affected by how INEC and the Federal Government as a whole are seen to behave in all matters relating to the elections,” he said. Mr Anyaoku said the contributions of the media organisation to nation-building were as note-worthy as those of its founder, late Chief Obafemi Awolowo. In her address, Chairman of the media organisation, Tokunbo Awolowo-Dosunmu, said Nigerian Tribune had played its part in nation-building since it was founded 70 years ago. Prominent Nigerians, including Bishop Matthew Kukah, who delivered the keynote address; a leader of Afenifere, Ayo Adebanjo; a former governor of Ogun State, Gbenga Daniel: a former Deputy Governor of Lagos State, Femi Pedro: and Convener of Save Nigeria Group, Tunde Bakare were present at the occasion. Presidential candidate of Young Democratic Party, Kingsley Moghalu and the Peoples Democracy Party (PDP) governorship candidate in Lagos State, Jimi Agbaje, were also present at the occasion where the new logo of the newspaper was unveiled.